Bill Murray has joined the Army, and the Army will never be the same! 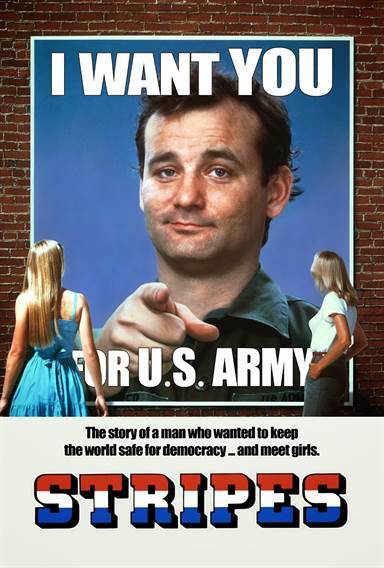 When John Winger (Murray) loses his job, his car, his apartment and his girlfriend, all in one day, he decides he only has one option: volunteer for Uncle Sam. He talks his friend Russell (Harold Ramis) into enlisting with him. Where else, they figure, can they help save the world for democracy and meet girls! John and Russell find basic training a snap: they are arrested twice, have endless run-ins with their drill sergeant (Warren Oates) and get into a big mess at a female mud-wrestling match. They even steal a top secret government vehicle to take some gorgeous female MPs on a date, and wind up behind the Iron Curtain. Stripes is outrageous fun! And that's the fact Jack! Download Stripes in Digital HD from the iTunes store. Listen to the Stripes soundtrack on Apple Music. Stripes images are © Columbia Pictures. All Rights Reserved.